MinD in a Device Co., Ltd. MinD in a Device Co., Ltd. (head office: Setagaya-ku, Tokyo, Japan; CEO: Tsubasa Nakamura; “the Company,” below) was established in December 2018, and has started seed round funding through a third-party allotment of shares with Tomy Kamada (CEO, TomyK Ltd. and ACCESS co-founder), who has been supporting many technology startup companies, and others serving as the recipient. 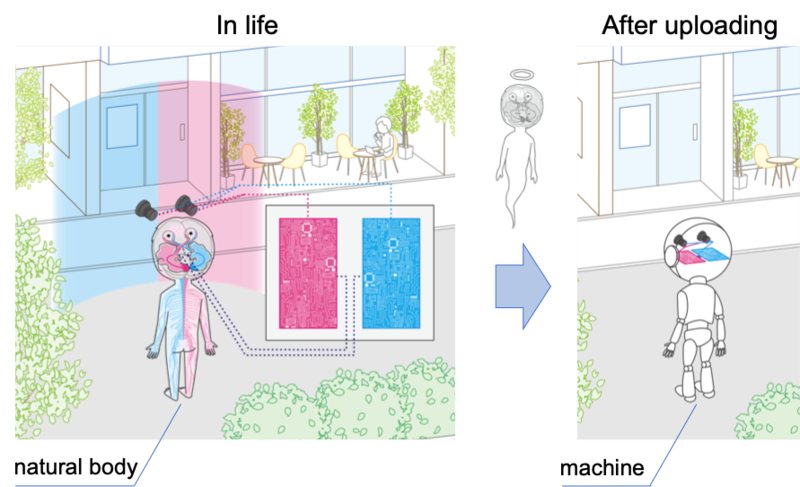 The Company is a university-originated startup that aims at realizing the concept of uploading human consciousness to machines, as described in a book by technical adviser Masataka Watanabe (Associate Professor in Neuroscience, Graduate School of the University of Tokyo). As a first step, the Company will advance large-scale research and development toward next-generation AI that implements the “generative model” that is considered to be the source of consciousness. The Company is a university-originated startup that aims at uploading human consciousness onto a device (machines・computers) within 20 years, based on fundamental research and ideas by our technical adviser Watanabe as described in his papers published in Science and other journals. Fig. 1: A world in which consciousness has been uploaded to a machine (a computer, etc.). Left: Uploading is completed by connecting a human brain with a machine to unify consciousness and share memories. Connection is established via a brain machine interface between the right biological and left machine hemisphere, and vice versa. Right: Even after the human brain reaches the end of its activity, life continues with consciousness residing in the machine. 1-1. What is consciousness uploading? ・The foundation of consciousness is a neural algorithm referred to as a “generative model,” which produces a virtual reality within the brain. When we are awake, sensory input synchronizes this virtual reality with the outside world, but while we sleep our consciousness in dreams is unfettered by such restraints. ・A machine implementing a generative model is capable of harboring a neutral template consciousness. ・The neutral consciousness of a machine and that of a connected human brain can be integrated, and by transferring memories to the machine the personal consciousness will continue to live on even after death of the biological body. This is equivalent to saying that even after one cerebral hemisphere is lost due to cerebral infarction, etc., the other hemisphere continues to live. Realizing consciousness uploading would present possibilities for fundamentally changing humanity. In particular, it opens up the ultimate option of arbitrary lifetime extension for those wishing to achieve immortality or those wishing to live for longer than their biological body will allow. As a first step towards realization, we will develop a next-generation AI that implements a generative model and advance its materialization towards socially beneficial projects. 2-1. What is a “generative model”? The generative model proposed by researchers such as Mumford and Kawato et al. incorporates frameworks for both “bottom–up” processing, which produces high-level predictions based on low-level inputs, and “top–down” processing, which works from higher to lower levels. Top–down processing simulates outer-world subjects in our inner-world virtual reality, thereby incorporating models for our understanding and knowledge of those subjects, allowing us to improve the accuracy of our predictions. Such generative models remain at the research stage, however, and are not yet realizable in a practical form. The company’s next-generation AI uses novel technologies for high-level implementation of top–down processing mechanisms to realize a generative model. Taking medical imaging as an example, this approach incorporates biological mechanisms of disease with physical mechanisms that capture lesions through measurement methods such as MRI and CT. At present, skilled physicians supplement their readings of medical diagnostic images with knowledge retained in their heads, but our AI is expected to provide significant contributions as a physicians' diagnostic aid by incorporating subtleties of information far in excess of human cognitive abilities. From the features described above, fields in which the Company’s AI is expected to be applied are rapidly growing markets in which high specialized expertise is required, including medicine and healthcare, smart cities, autonomous driving, and space and aviation. The Company has already partnered with Fujitsu Ltd., Nagoya University, and others. 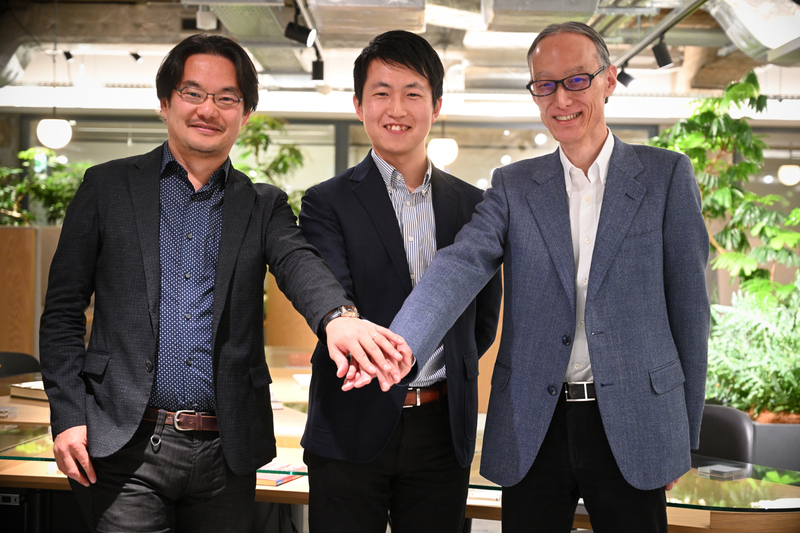 With the cooperation of Tomy Kamada (CEO, TomyK Ltd.) and Yutaka Matsuo (Adjunct Associate Professor, University of Tokyo; President, Japan Deep Learning Association), this funding will allow the Company to recruit more machine learning engineers to further engage in R&D, and to promote business alliances and commercialization with companies operating in various fields. Name: MinD in a Device Co., Ltd. Graduated from the Keio University Graduate School of Science and Engineering, 2009. Starting work for Toyota in the same year, he experienced several project management jobs. Becoming convinced that human–machine interfaces for consciousness will provide a next-generation industrial base from his interests in integration between humans and machines, he established independent commercialization in 2019. Graduated from the University of Tokyo Graduate School of Engineering in 1998. Following appointment as an assistant in that year and assistant professor in 2000, he studied at the California Institute of Technology, and he currently holds positions as Associate Professor in Neuroscience at the Graduate School of the University of Tokyo and as Visiting Researcher at the Max Planck Institute. He specializes in neuroscience, and is engaged in a wide range of theoretical and experimental research with a particular focus on consciousness. He has been published in leading scientific journals such as Science, and his book Brain Consciousness, Machine Consciousness has received high praise. He co-founded MinD in a Device with Nakamura to realize the concept of consciousness uploading as the culmination of approximately ten years of research. Contact MinD in a Device Co., Ltd. Public Relations Strategy Dept. Watanabe, M. (2017). Brain Consciousness, Machine Consciousness. Chuokoron-Shinsha. Watanabe, M., Cheng, K., Murayama, Y., Ueno, K., Asamizuya, T., Tanaka, K., & Logothetis, N. (2011). Attention but not awareness modulates the BOLD signal in the human V1 during binocular suppression. Science, 334 (6057), 829-831. Mumford, David. "On the computational architecture of the neocortex." Biological cybernetics 66.3 (1992): 241-251. Kawato, Mitsuo, Hideki Hayakawa, and Toshio Inui. "A forward-inverse optics model of reciprocal connections between visual cortical areas." Network: Computation in Neural Systems 4.4 (1993): 415-422. Following the implementation of an AI-based generative model, we will then transform it into a spiking network for connection with the human brain. A spiking network does not approximate each neuron’s output with a continuous value representative of its firing rate. Rather, it resolves the mechanisms of binary information transmission at the time-scale of neuron action potentials as in an actual brain, which is considered essential for connecting brains to machines. After that, a machine implementing this network will be connected to a living brain to verify whether consciousness is actually perceived. Consciousness is an individually subjective sense, and thus positioned such that its existence in a machine can only be subjectively confirmed. When such a verification is successful, the machine will be confirmed to harbor a neutral awareness. Then, consciousness uploading will be completed by transferring memories, etc. Fig. 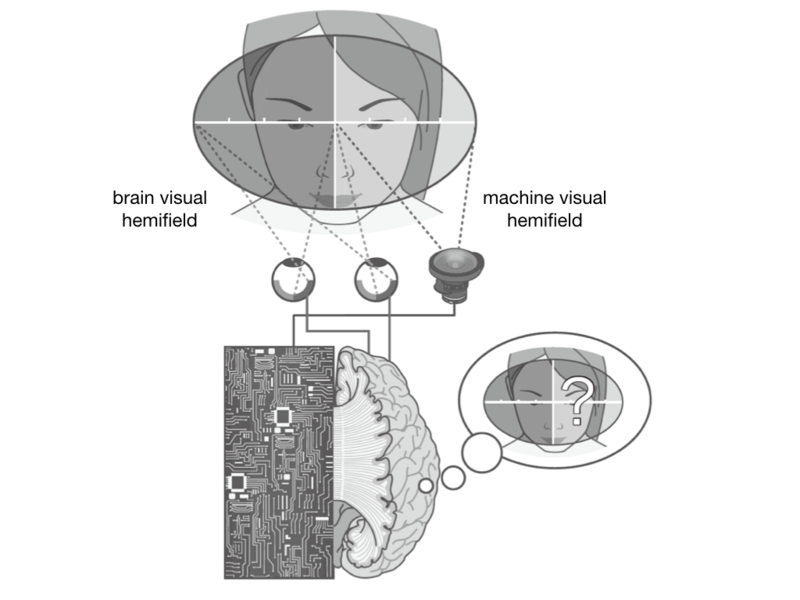 2: After replacing one cortical hemisphere of our own brain with a mechanical hemisphere and subjectively perceiving a unified consciousness, in other words, experiencing that the right and left visual fields appear as a unified whole, we may conclude that consciousness resides in the mechanical hemisphere and has been linked with the consciousness in the remaining biological one. Source: Watanabe, M. Brain Consciousness, Machine Consciousness. Chuokoron-Shinsha.